Apple work from home program is a legitimate way to work remotely. In fact, it’s quite popular in the world of work from home — and for good reason. For starters, Apple was the first American public company to cross the major $1 trillion in market value. Impressive, right? And then there’s the cult-like popularity of their many products, including iPhones, iPads, Macs, and AirPods. Who wouldn’t want to work for one of the largest most in-demand companies in the world? 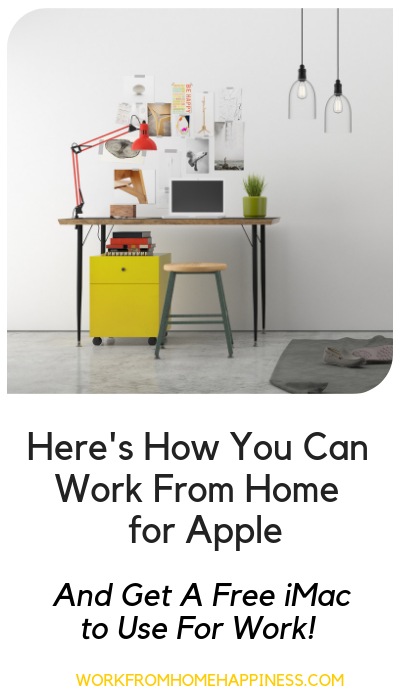 And, what’s even better, you can work remotely as part of the Apple work from home team. Before you get excited and start thinking, “Sign me up,” a little bakcground info is definitely needed. Remember, not all work from home jobs are created equal. And, just like any job opportunity, there are pros and cons that need to be weighed. Here’s what you need to know about Apple work from home, including available job titles, restrictions, requirements, benefits, and of course tips on how you can actually get hired! The main jobs Apple has for remote workers is through their At Home Advisor Program. An At Home Advisor is part of AppleCare, which is Apple’s very own customer service department. If you’ve ever called Apple needing help with anything from iTunes to rebooting your iPad, you’ve spoken to a representative in the Customer Care Department. At Home Advisors get to help customers from their home offices instead of a cramped cubicle. What Kind Of Customer Service Issues Will I Deal With As An At Home Advisor? It depends. As an At Home Advisor, your job is to respond to customers’ questions — which can range from general inquiries about products to more in-depth queries regarding tech support. At Home Advisors are able to help Apple customers via phone or chat, depending on the issue. Do I Need To Be An Apple Product Expert To Become An At Home Advisor? The short answer? No! Although customers can call in to ask questions about any Apple product or accessory, it doesn’t mean every At Home Advisor must know everything about all things Apple. You will have the chance to learn the full product line, but are not expected to handle support issues for all products at any given time. Is This Full Time, Part Time, Seasonal? Will I Actually Be Employed By Apple? The Apple Work From Home Team can be both full-time and or part time. Either way, all At Home Advisors are employed directly by Apple. As An Employee, Does That Mean I’ll Get Benefits? Absolutely! Both full time and part time Aplle Work From Home employees receive benefits, which include paid time off, health insurance options, and even product discounts! Do I Need A Home Office? Not sure about your current internet connection? Use a free service, like Speed Test, to figure out your upload and download speeds. What About A Work Computer? Apple has got you covered. As an Apple Work From Home Advisor you’ll be issued an iMac and headset to be used exclusively for work! Of course. All new hires go through paid training as part of the Apple Work From Home Advisors team. The entire training program lasts between 5 and 7 weeks and is completed virtually with a live instructor. Once training is complete, you’ll be ready to take on live customers using Apple’s unique approach to customer service. And, don’t worry, training takes place at your home office using the company-provided iMac! I’ve Never Used A Mac Before. Does That Matter? Not necessarily. However, it is beneficial if you have previous Mac experience or familiarity with other Apple products. If you have experience troubleshooting other operating systems, like Windows, and are willing to learn about Macs then you can still be considered for the program. What Hours Will I Work? That depends on your schedule. But, keep in mind, this is a customer service and support position. That means Apple Work From Home Advisors are expected to work evenings, weekends, and even major holidays. I’m Interested. How Can I Be Sure I’m Right For The Job? If you love technology and enjoy helping people, this is a great fit for you. An ability to troubleshoot problems, offer resolutions, and work independently are all musts. Remember, a love for Apple products isn’t a prerequisite, but it certainly helps! Awesome. Where Can I Apply? Head on over to the Apple At Home Advisor Career Page. There, you can learn more about the Apple Work From Home Program and search current job openings. What’s The Application Process Like? The first thing you have to do is sign in with your Apple ID. If you don’t have, you can easily create one. These questions are used to determine whether or not you have the basics needed, i.e., experience and home office capabilities, to be successful. How Can I Increase My Interview Chances? Great question! Today, many big-name companies, like Apple, use Applicant Tracking System (ATS) to find the best candidates. ATS is a recruiting software that streamlines the hiring process for recruiters and hiring managers. When you, the job seeker, upload your resume it goes into the ATS. From there, the person in charge of interviewing and hiring uses the ATS to narrow down resumes from hundreds to a much more manageable number. To do that, they search resumes for keywords. This means, you need to make sure your resume has the right keywords in order to get found. If you don’t have the right keywords, your resume will never be seen by human eyes. The good news is it’s relatively easy to keyword optimize your resume. The keywords you need to get found are hiding in plain sight! All you have to do is look to the job ad itself. You see, the job listing employers place online are basically them describing their ideal employee. To make yourself the perfect fit, you simply need to pull the right keywords from the ad and place them strategically in your resume. It is. Just remember, only place keywords that are relevant to you and your experience on your resume. That is, no fibbing. If a company specifies candidates must have Photoshop knowledge and you don’t, it’s not okay to place Photoshop under your Skills Section just so you’ll fool the ATS. At first glance, keywords might not jump out at you. And, that’s okay. It can take a little practice to figure out what words need to make it to your resume and which don’t. Fortunately, there’s an easy-to-use online tool that takes the guesswork out of resume optimization. It’s called JobScan. 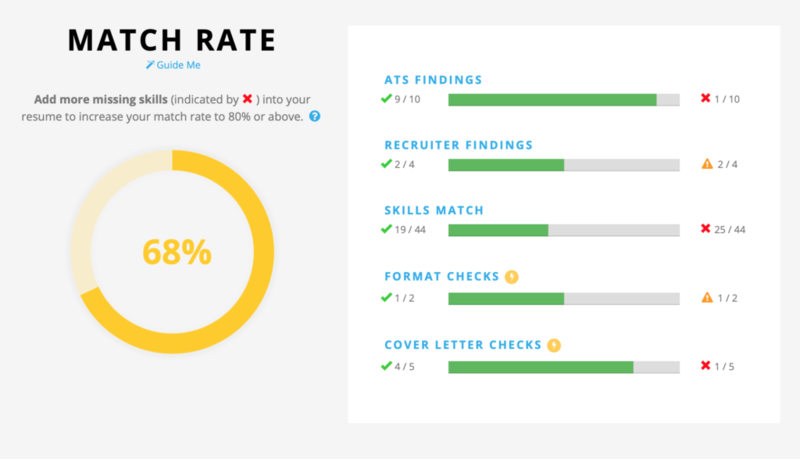 JobScan analyzes your resume against a job ad. Then, JobScan provides a report telling you how closely your resume matches the ad. In other words, JobScan lets you know how well you meet the ‘perfect candidate’ criteria. Generally, you want to shoot for an 80% match or better. If you fall short, that’s okay. JobScan will give you pointers and tips to improve your resume. You can use JobScan for free for up to 5 scans a month. And, as always, if you have any questions feel free to ask! Hit me with them in the comments below. You’ve got this! P.S. This post contains affiliate link. Check out my disclosure statement for more details. The post Apple Work From Home: Jobs Available And How To Get Hired appeared first on Work From Home Happiness. The post How I Find Remote Jobs By The Hundreds (And You Can Too) appeared first on Work From Home Happiness. Carol is enthusiastic about creating my first blog on the internet. Ever since my husband retired from the military in 1994; we lived through challenging times financially. My husband was diagnosed with MS shortly after he retired from the military. My passion at the present is to discuss various ways to pay off debt by creating a blog.